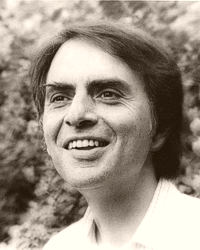 Carl Sagan completed a Ph.D. degree in astronomy and astrophysics at the University of Chicago during 1960. From 1962 to 1968, he worked at the Smithsonian Astrophysical Observatory in Cambridge, Massachusetts. From the 1950s onward, he worked as an advisor to NASA where among other things, he performed pre-launch briefings for Apollo astronauts. Sagan also contributed to many robotic space probe missions. Sagan was a proponent of the search for extraterrestrial life. He conceived the idea of adding a universal message to interstellar space probes that could be deciphered by any reasonably advanced extraterrestrial intelligence. The first message was sent on Pioneer 10 during 1972 in the form of an engraved plaque made of gold-anodized aluminum. The following year Pioneer 11 carried another copy of the plaque. The most elaborate message he helped design was the Voyager Golden Record that was attached to the Voyager space probes during 1977. Sagan also urged the scientific community to use radio telescopes to detect intelligent extraterrestrial radio signals. Part of this effort also included transmitting signals from Earth in the hope that they might someday be detected by other civilizations with technology similar to ours. To this end he helped Dr. Frank Drake compose a message and transmit it on November 16, 1974 from the Arecibo station. In 1982 over 70 scientists including seven Nobel Prize winners supported Sagan by signing a petition advocating SETI. The petition was published in the journal Science and it brought SETI immediate scientific respectability. Sagan's contributions were also central to the discovery of the high surface temperatures of the planet Venus. Contrary to the claims of some contactees during the 1950s that Venus was an extraterrestrial paradise and the home base for UFOs, Sagan discovered that radio emissions from Venus indicated a surface temperature of 500 °C (900 °F). As a visiting scientist to NASA's Jet Propulsion Laboratory, he contributed to the first Mariner missions to Venus. Later, in 1962, Mariner 2 confirmed that the atmosphere of Venus is extremely hot and dense, with a surface pressure approximately 92 times that of Earth. Sagan was among the first to hypothesize that Saturn's moon Titan might possess oceans of liquid compounds on its surface and that Jupiter's moon Europa might possess subsurface oceans of water, a fact later indirectly confirmed by the space probe Galileo. Sagan also helped solve the mystery of the reddish haze seen on Titan, revealing that it is composed of complex organic molecules constantly raining down onto the moon's surface. Carl Sagan was involved on both sides of the The UFO debate. During the 1950s, at the onset of the modern era in ufology, he defended the idea that some UFOs could be extraterrestrial visitors ( see excerpt below ). In 1966, he was a member of the O'Brien Committee, also known as the USAF Scientific Advisory Board Ad Hoc Committee to Review Project Blue Book. The O'Brien Committee recommended the creation of university-based study groups that would provide scientific support for Project Blue Book investigators. However as Sagan became further embedded in the scientific establishment, he became increasingly reserved when voicing his opinions about UFOs. Later Sagan would become a prominent member of CSICOP, and the group would triumphantly espouse him as their own particular brand of convert. But even as a member of CSICOP, Sagan always came across as the good cop, and his manner of delivery often suggested that he appreciated the spirit of genuine ufology, and that he knew more than he was letting on. Sagan had not always been such a severe critic of the UFO craze. He was a fan of science fiction and had not always held such a hardheaded view of the idea that visitors from other planets might be plying our skies. As a college student who had grown up on the fables of Burroughs, he had asked, Why not? He discussed his ideas with Muller, who listened good-humoredly to the younger scientist's ideas. Amidst a spate of front-page newspaper stories about UFO sightings Sagan even wrote a letter during the summer of 1952 to Dean Acheson who was secretary of state at the time, suggesting the government should perhaps take precautions in case alien visitors may not be friendly, and inquiring what defense plans were in place. As late as 1954, Sagan was still defending UFOs to Muller, who perhaps teasingly suggested that his friends the Soviets were sending mysterious craft with astounding technological capabilities to hover over American soil. Sagan apparently took the remark seriously, refining the concept point by point in a letter to Muller and defending the idea that the craft bore visitors from other worlds.